Peripheral artery disease is a condition involving the narrowing of the arteries, usually in the limbs. Millions of Americans suffer from the disease and for many it makes it difficult to fulfill basic work obligations. As a consequence they may be unable to earn adequate income to support them. Due to its disabling characteristics, many individuals who suffer from this disease qualify for long-term disability benefits. While there is no cure for the disease, many are able to manage symptoms and reduce their risk of further complications with treatment. If you or someone you love is suffering from peripheral artery disease and is unable to continue working as a result, the Indiana long-term disability attorneys of Hankey Law Office, may be able to help you with the complicated and sometimes stressful application process. To speak with an attorney today, contact us at (800) 520-3633. If you are dealing with complications from peripheral artery disease that are preventing you from working, having a skilled attorney may help you avoid the common mistakes applicants make when trying to obtain benefits. 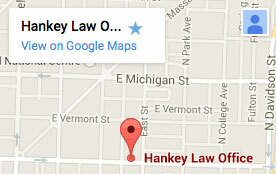 An Indiana long-term disability attorney of Hankey Law Office, is skilled and experienced attorney who is committed to helping clients apply for long-term disability benefits. If you or a loved one is afflicted with peripheral artery disease and in need of benefits, do not hesitate to contact us at (800) 520-3633.